What can one expect of a day that commences with the consumption of a can of lukewarm macaroni cheese, eaten with a Debenhams gift card? Standing in an empty layby near the Cluanie Inn, I gazed skywards at the mist-covered South Glen Shiel ridge. The forecast was for this theme to continue: mist and intermittent rain. The same thought ran through my head: today, I actually have to use a compass. Not just carry one and be deemed ‘prepared’ should I tumble off a cliff and need rescue. I am going to have to navigate. On my own. I contemplated calling the whole thing off. I contemplated the north ridge instead. 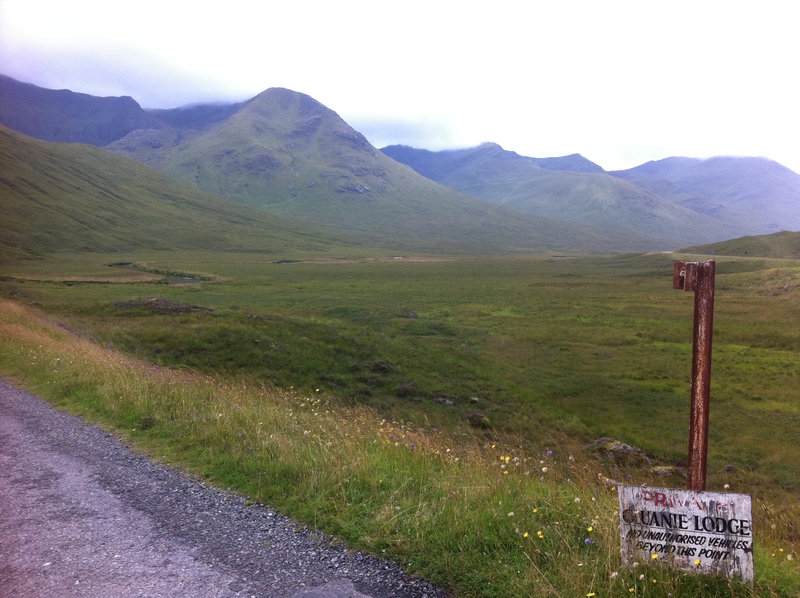 But the lure of nine Munros – from Creag a’ Mhaim in the east to The Saddle in the west – was too great, and I set off running slowly towards Cluanie Lodge. The problem with running over nine Munros – especially in the mist – is that it is subsequently difficult to recall the characteristics of the individual mountains and summits, or to even remember their names. Creag a’ Mhaim was memorable as number one, followed by Druim Shionnach because I gained a rare view from the summit. Thereafter, it’s a blur. I crossed Aonach air Chrith, the day’s highest point, and clambered along the ridge to Maol Chinn-dearg. Sgurr an Doire Leathain I recall because I twice went the wrong way as I tried to re-find the ridge from the summit. The mist had closed in by now; the weather getting worse as I progressed west. There is nothing pleasant about running in waterproof trousers. Still, there were moments of unexpected joy: the view to Loch Quoich as I skirted Sgurr Beag, a dozen ptarmigan battling the wind on Sgurr a’Bhac Chaolais, a glorious vision of Loch Hourn. I took the steep way up Sgurr na Sgine, popping out by the summit cairn. A tricky descent was followed by a straightforward ascent, watched by a herd of deer, of The Saddle. Finding the trig pillar, I knew I couldn’t go wrong from here. I turned to what I thought was the east, and headed for the famous Forcan Ridge. It’s a good thing for me I’m never surprised when I make a navigational error, such is the regularity of these occurrences. An absolutely-nothing-can-go-wrong approach means everything is about to go wrong. It turned out I was moving west, not east. It took me 10 minutes to work that out. As a belligerent soul, there was no way I was reversing what I’d just done. Even if it was going to add on two hours, I wasn’t turning round. I pressed on, blundering over two of The Saddle’s Munro tops, before plunging down a slippery, mossy slope to the river that flows to Shiel Bridge. I’ve never been so pleased to see a caravan site. I hadn’t seen another person since leaving Cluanie. I thought for a moment: macaroni cheese for breakfast, a Jacobite with a fetish for licking, rain, sludge, rain, waterproof trousers flapping round my ankles, rain, mist, rain, navigational incompetence, torrential rain. ‘I wouldn’t quite describe it as a ‘good time’,’ I said.